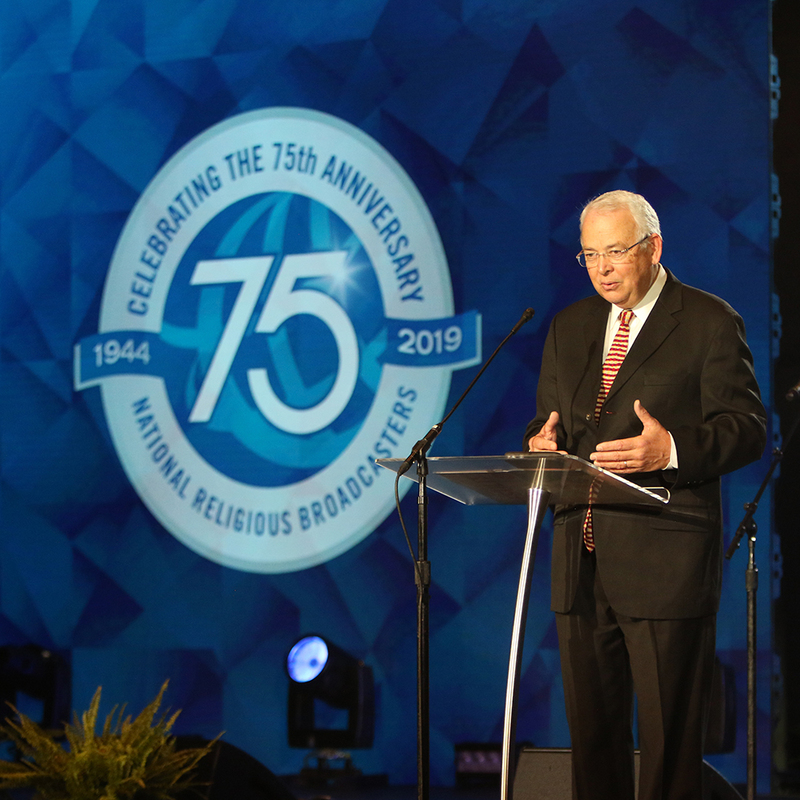 ANAHEIM, Calif. (NRB) – NRB Board Chairman Michael Little looked back at the storied 75-year history of the NRB and looked forward to its future during the March 26 Opening Session at Proclaim 19, the NRB International Christian Media Convention in Anaheim, California. “We can withstand great pressure. We can withstand great heat. We can reflect the light of what’s coming down upon us,” he said. Little talked about the difficulties religious broadcasters in America were experiencing when the NRB was formed in 1944. Ministries like Charles Fuller’s Old Fashioned Revival Hour and Walter Maier’s The Lutheran Hour were in crisis. Political correctness was about to get them off the air, Little said. Evangelical Christian broadcasters got together and said, “We’ve got to unite. We’ve got to get together and organize.” So in Columbus, Ohio, on April 12, 1944, 150 religious broadcasters organized and launched the NRB. Little said a principle that can be learned from the NRB’s forefathers is the need for unity. The apostle Paul wrote about this type of unity in Ephesians 4, he said. “Maintain unity so that you’ll have the strength in order to withstand all of the difficulties and take all of the opportunities that are ahead of you,” Little said. Little said the purpose and mission statement from the beginning of the NRB still rings true today: advance biblical truth, promote media excellence, and defend free speech. He highlighted all the platforms religious broadcasters have used over the years, including radio, television, and movies. Little said today’s technology, like the cellphone, is a gateway to connecting to the world like never before. “It’s the power of the internet, along with the broadcast airwaves, that we’re excited about,” he said. He pointed to powerful NRB opportunities in the future, including YouTube, Facebook Live, podcasts, virtual reality, and video gaming. What technologies will come next? What will be the new breakthrough? he asked. Little said religious broadcasters need to put themselves in a position to hear God’s voice of creativity. Little finished his address by sharing his optimism about NRB’s future. Little’s term as chairman of the NRB Board of Directors concluded with Proclaim 19. Janet Parshall, host of In the Market with Janet Parshall, was elected chairman during the annual business meeting, March 26.